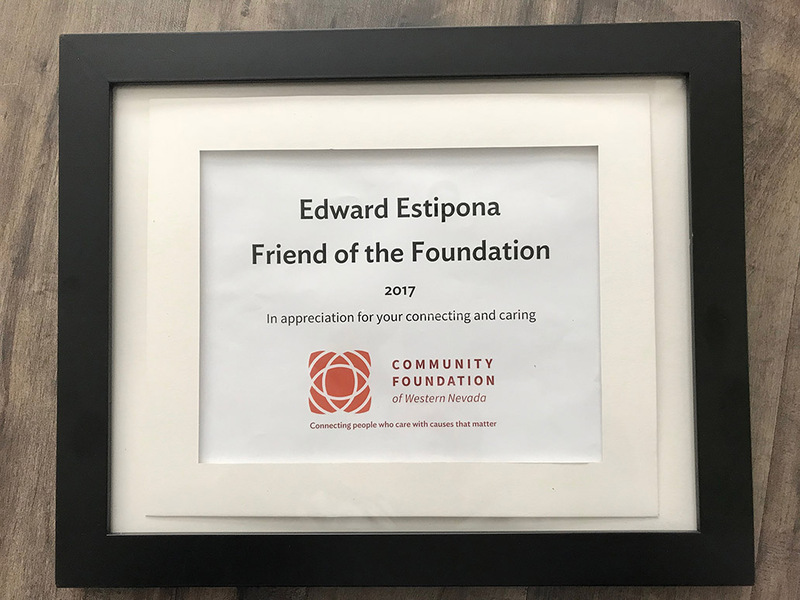 I was recently honored and humbled to receive the 2017 “Friend of the Foundation” award from the Community Foundation of Western Nevada, a philanthropic organization that is near and dear to my heart. Quick fact: Did you know in its 19 years in existence, the Community Foundation has awarded $100 million in grants locally? Now that’s impressive. Anyhow, back to the focus of this post — which, by the way, is not about me or my award. It’s about you. You see, as part of this award, I was given the opportunity to make a $500 contribution to a philanthropic cause of my choice — the only stipulation being that it’s a 501(c)(3). This is a great opportunity — but also, a huge challenge, because every cause I support personally and that we support through the Estipona Group is entirely worthy. As a team, the Estipona Group last year began performing good deeds equal to the number of years we’ve been in business. So in 2016 it was 23 deeds for our 23 years in business, this year it’s 24. And so on. So I thought: Why not give the $500 to one of the non-profit organizations we’ve already come to know and love and support through our good deeds? But that means I’d be forced to choose one worthy organization over another. And that’s no fun. So instead, we first decided to narrow the field, randomly selecting four non-profits — those designated as 501(c)(3)s — from the last few years. This yielded the following options. But we hate popularity contests, especially when non-profits are involved; no one wins when you pit worthy causes against one another. But we CAN win by pitting worthy ways of SELECTING a worthy cause against one another. I’m asking you to choose HOW I choose. We’ll be running a poll on our Twitter page from Nov. 7 through Nov. 14, with four choices. In this Twitter poll, you’ll be voting on the method you’d like me to use to randomly select which non-profit gets the $500. And of course: We’ll Facebook Live the winning picking mechanism. Because sharing is caring. So help me choose, won’t you? Learn more about these four amazing non-profits, vote in our Twitter poll, and help one local philanthropic organization earn $500. And we think it’s remarkable that so many of our friends care as deeply as they do — and that there are so many worthy causes who stand to benefit. Edward Estipona is president, CEO and founder of the Estipona Group. He’s known to randomly spew malaphors, and for some inexplicable reason, reports he enjoys climbing uphill on a road bike much more than descending. Email him at Edward@estiponagroup.com.